Tag-Archive for "El Dorado 15 Year Old Rum"
This year is the 50th anniversary of Guyana gaining independence from the United Kingdom and El Dorado rum is celebrating. The Whisky Exchange will be joining in the party with a tasting featuring the celebratory El Dorado Grand Special Reserve, bottled in honour of the anniversary and costing £2,750 a bottle! 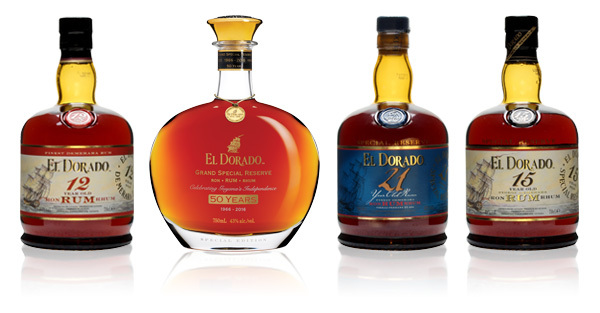 Well known for its rich, dark and complex style, El Dorado produces some of my favourite rums. A big hit with whisky drinkers as well as rum fans, it’s dark rum at its best. Your host for the evening is master distiller Shaun Caleb, who learned the trade under legendary Demerara rum maker George Robinson. A Princeton-educated chemical engineer, Shaun combines a modern take on distilling with the more traditional approach of his mentor, helping him make some of the world’s best rums. They’ll start with a cocktail and then Shaun will take you through the El Dorado range and the new anniversary release. This is an amazing opportunity to taste some of the world’s finest rum – let your taste buds be wowed! The one that you won’t want to miss. Whether you are dyed-in-the-wool rum lover or new to rum, you NEED to get tickets to this session. A rare chance to sample El Dorado 25 Year Old, a limited edition vintage rum. Distilled in 1986 and blended by the late Master Distiller at the Diamond Distillery in Guyana, only 4000 bottles were made and this is your chance to try magic in a bottle. Stefanie will build up your taste buds with samples of El Dorado 12 Year Old, 15 Year Old and 21 Year Old rums beforehand. More details can be found here.